What is a Two-Way Communication System? 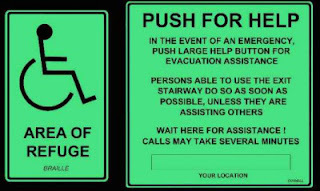 A two-way communication system is a means of communication between a constantly attended support staff and building occupants unable to exit the building via the stairs due to injury or disability. In short, two-way communication systems have two key components; a master station (typically installed in the fire command center or other approved location) and Call Boxes required to be provided at the landing of each elevator on each accessible floor that is one or more stories above or below the level of exit discharge. These areas provided with two-way communication systems are known as Areas of Refuge. 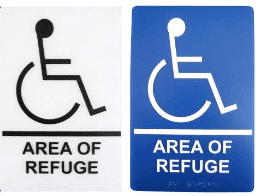 An area of refuge is a location in a building designed to hold occupants during a fire or other emergency, when evacuation may not be safe or possible. Occupants can wait there until rescued or relieved by firefighters or first responders. Just like it sounds, a two-way communication system allows stranded occupants to talk back and forth with trained personnel at said attended location. Note: When you come across the term one-way voice communication system, this is reference to a PA (public address) or fire alarm emergency voice/alarm communication system. The term one-way means exactly that, the operator of the microphone can only communicate out. There is no means for the intended listeners to communication back. What Codes and Standards are Two-Way Communication Systems Noted in? NFPA 72 2016 (National Fire Alarm and Signaling Code) Sections 24.10.1 - 24.10.8, 24.13.4 and it's noteworthy to mention sections 10.6.9.1, 10.6.9.1.1, and 10.6.7.2.1 for "Monitoring Integrity of Power Supplies" 24.3.13.9.1, 12.4.3, and 12.4.4 for cable and survivability requirements. Lastly Table 14.3.1 #25 for testing requirements. International Building Code 2015 Section 3008 under "Occupant Evacuation Elevators"
The International Building Code (IBC) now requires a two-way communication system in all new construction regardless if they have a sprinkler system or not. Also, significant remodels or change of use of a building may require Areas of Refuge. See the code adoption map below to see if your State is up to date! Where to Start when Designing a Two-Way Communication System for Areas of Refuge. Remember, CODES tell you when you have to install two-way communication systems and STANDARDS tell you how to install them. This is important as it makes it easy to navigate to the appropriate document when you need information on either. Example, if you need to know what height the call boxes are required to be mounted at, you are going to turn to the Standard (NFPA 72). If you want to know what levels of a building require call boxes, you are going to turn to the Code (NFPA 101 or IBC). Areas of Refuge are required to be provided with an approved two-way communication system complying with sections 1009.8.1 and 1009.8.2. These two sections cover "system requirements" and "Directions". As noted above in the introduction, two way communication system call boxes are required to be provided at each elevator landing on each accessible floor that is more than one stories above or below the level of exit discharge. two-way communication systems are not required at the landing serving only freight elevators. This is a big one that always come up. Two-way communication systems are required to communicate between the required call boxes and master station installed in the fire command center or approved location. If the master panel location is NOT constantly attended, the two-way communication system shall have a timed automatic telephone dial-out capability. The master station shall dial out to a monitoring location or 9-1-1, Also note the two-way communication system shall have BOTH audible and visual signals. It is a requirement to provide directions on how to operate the two-way communication system. These directions shall be placed adjacent to the two-way communication system and the signage shall comply with the ICC A 117.1 requirements for visual characters. Each door providing access to an Area of Refuge an adjacent floor area shall be identified by a sin stating: AREA OF REFUGE. Signage shall comply with the ICC A 117.1 and include the International Symbol of Accessibility. Where exit sign illumination is required by Section 1013.3, the signs shall be illuminated. 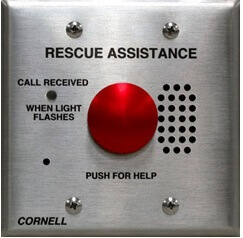 All doors used for Areas of Refuge and Exterior Area for Assisted Rescue shall have signage with visual characters, raised characters and braille complying with ICC A 117.1. 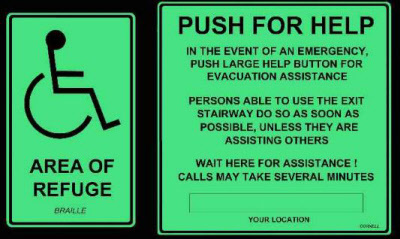 "Persons able to use the exit stairway do so as soon as possible, unless they are assisting others." Directions for the use of the two-way communication system where provided. This goes along with the "Directions" noted above. International Building Code "Stairway Communication System"
If the stairway doors are locked, not less than every fifth floor shall be equipped with a telephone or two-way communication system connected to an approved constantly attended station. What does NFPA 101 Have to Say About Two-Way Communication? Each of these sections cover the same requirements of Section 1009 in the 2015 International Building Code. Mounting Heights for Two-Way Communication System and Area of Refuge Equipment. Let's Consult NFPA 72 to See How We Install Two-Way Communication Systems. 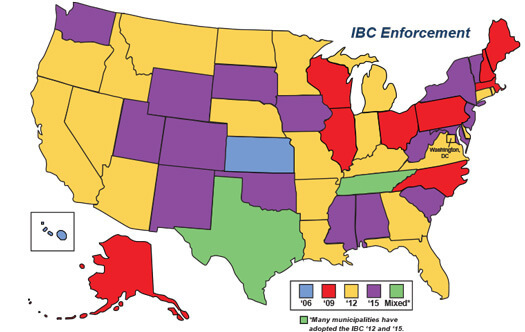 Sections 24.10.1 through 24.10.8 briefly mention the same requirements found in the 2015 IFC and NFPA 101. As with anything related to life safety, all pathways between the remote Area of Refuge call boxes and master station shall be monitored for integrity. Unless otherwise permitted by or required by Section 10.6.9.1.3 and 10.6.9.1.6 all primary and secondary power supplies shall be monitored for the presence of voltage. Loss of primary or secondary power shall initiate a trouble signal in accordance with Section 10.14. The secondary power supply (a.k.a. battery backup) shall have the capacity to operate the two-way communication system in a non-active condition for a minimum of 24 hours. At the end of this period, the system shall be capable of operating in active status for 5 minutes. NFPA 72 2016 Section 24.3.13.9.1 stated "Area of Refuge emergency communication systems shall have a pathway survivability of level 2 or level 3." Level 1 is permitted when the building is less than 2-hour fire rated construction. Shall be tested at Initial Acceptance and annually thereafter. Method of testing: "Verify location and condition"
In closing we now know that two-way communication systems are required for areas of refuge and elevator landings on floors that are accessible. These two-way communication systems are required to be installed with a pathway survivability level 2 or level 3 and the master station shall be installed in an area that is constantly attended. Areas of refuge with two-way communication systems have been hot for some time now so make sure to read up and become familiar with the codes and standards for them.